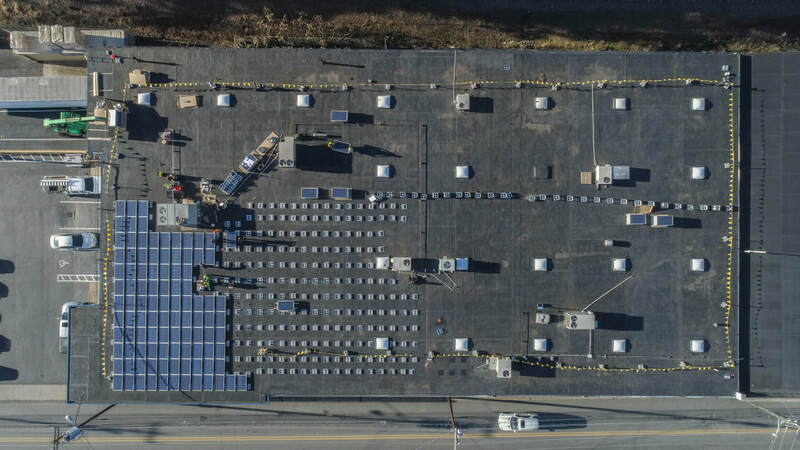 Distributive Solar is pleased to announce the completed installation of a 74kW #solar PV system for Non-Profit, Victory Human Services, INC of Brockton, Massachusetts. Solar array was installed by Harvest Power Solar Panels Installation and completed in 4th Quarter of 2018. VHS receiving energy savings through solar power purchase agreement. 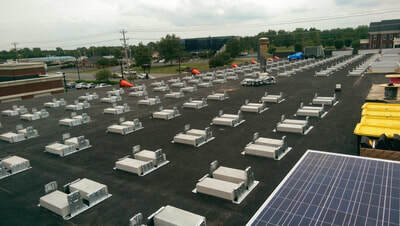 Distributive Solar, LLC has arranged the successful installation of a 22 kW rooftop solar system on behalf of Solar Alliance, of Knoxville, TN. 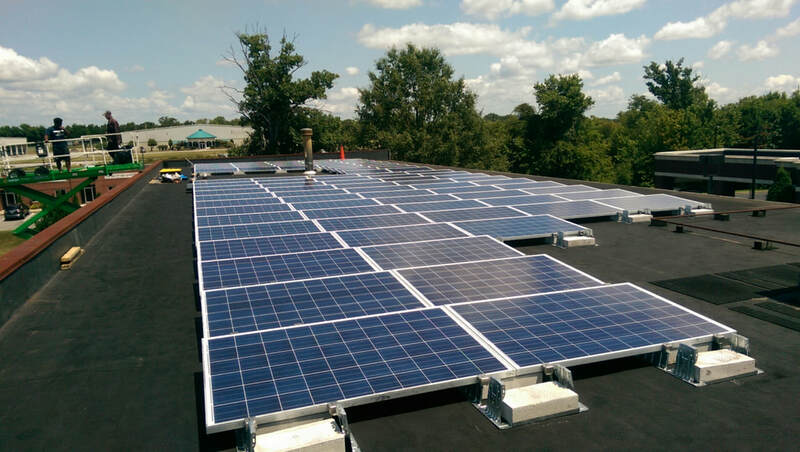 This project is one of the first small business commercial solar arrays in Lebanon, TN. ​The solar technology system has been purchased by AAMCO Transmissions & Total Car Care of Lebanon to maximize building revenues and reduce energy expenditures. “ As our electricity cost continue to rise year after year, we saw solar as away to reduce our energy cost and increase the value of our building, says owner Brad Isbell." 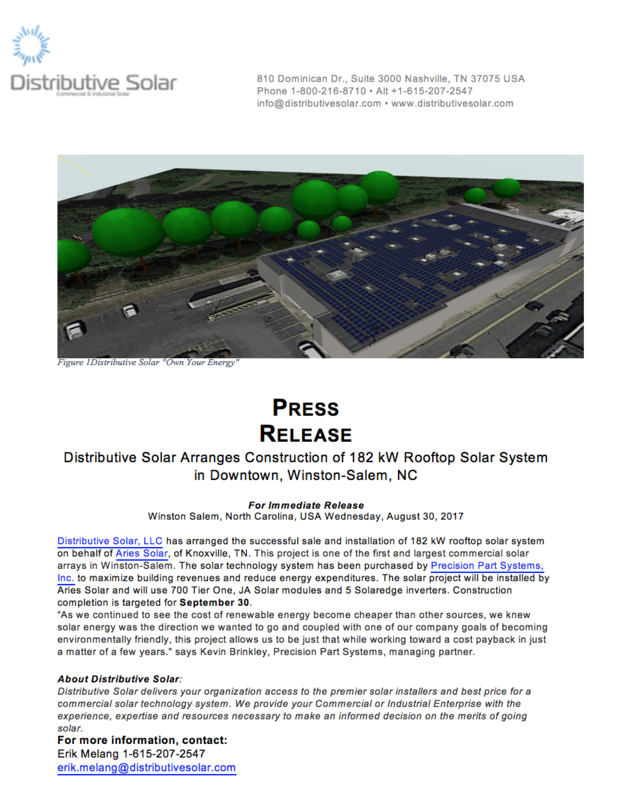 The solar project will be installed by Solar Alliance and will utilize the latest in panel level electronics. The solar technology system has been install and is awaiting interconnection into the TVA Green Power Provider Program. Distributive Solar delivers your organization access to the premier solar installers and best price for a commercial solar technology system. We provide your Commercial or industrial Enterprise with the experience, expertise and resources necessary to make an informed decision on the merits of going solar. Solar power helps small and medium size businesses improve profitability without changing their business model. Making #solar power accessible to more and more businesses. Savings are straightforward to forecast as panel efficiency and average #sunlight are known and predictable. There are four boxes to check to determine the feasibility of solar on your building. Distributive Solar will provide your organization with a utility rate structure review and site analysis to determine if #solar makes sense for your business. Simply provide Distributive with one utility bill and we can begin our complimentary review. 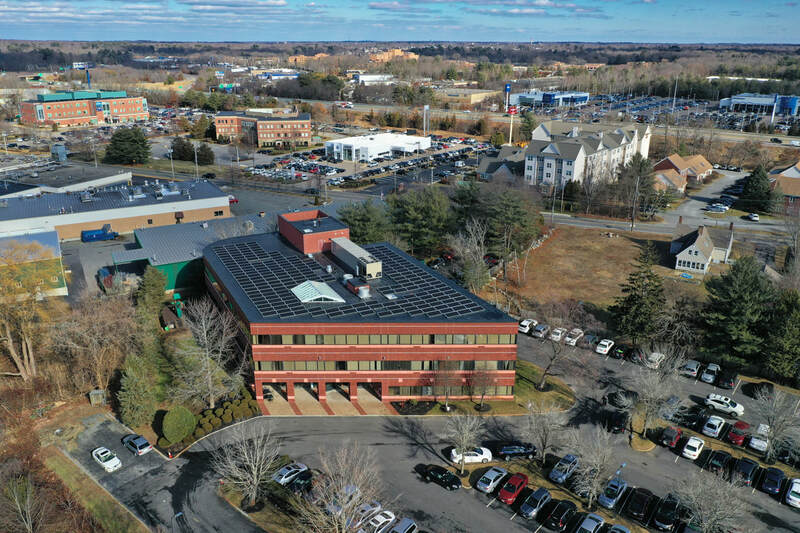 Distributive Solar is pleased to announced the contract signing of a 74kW #solar PV system for Non-Profit Victory Human Services, INC in Brockton, Massachusetts. Solar array to be installed by Harvest Power Solar Panels Installation Project targeted for completion in Spring, 2018. Own Your Energy! ​Welcome to one of the fastest growing and disruptive industries in the world. The Clean Energy Revolution is upon us and will dramatically alter the landscape of how energy is produced and distributed in the United States and the World. From energy efficiency, smart control devices, EV’s, Wind, Solar PV, battery storage and the block chain, things are changing exponentially. There is no turning back! The solar industry has doubled every 2 years and is growing jobs 17 times faster than the US Economy. Currently, there are over 260,000 people employed by the solar industry in well paying professions from installers, electricians, designers, manufacturing and business development. 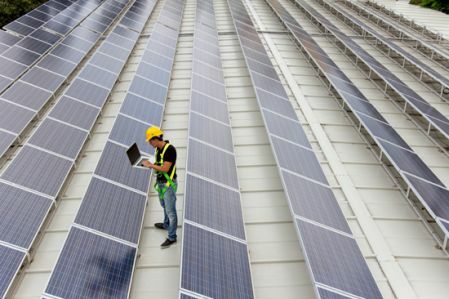 The price of solar installations for a commercial enterprise has come down dramatically (despite pending trade tariff) and many business owners are not aware of the tremendous opportunity to reduce operating expenses, increase property value, reduce carbon footprint and enhance their brands through solar. After all, system payback for solar installations can be in as little as 4-6 years with ROI’s exceeding 15%. With all this positivity around solar, low interest rates and a growing economy, why are many businesses slow or hesitant to adopt this proven technology? Why the disconnect? We as an industry, have to figure out a better way to educate, finance and quicken the market. Commercial and Industrial Solar Distributive Solar delivers your organization access to the premier solar installers and best price for a commercial solar technology system. We provide your Commercial or Industrial Enterprise with the experience, expertise and resources necessary to make an informed decision on the merits of going solar. Our global economy is changing at an ever accelerating pace. Technology is growing and broadening exponentially and we are living in a very dynamic age, the "Third Industrial Revolution" some would say. We can't take things for granted anymore and we have to be flexible and prepared. This is certainly true when it comes to how and why we invest in infrastructure and how we protect our assets/margins and more importantly, how we secure a better future for our families, our businesses and communities. It has been very difficult to predict and measure the pace, direction and impact of "change" in our societies and over the last decade. From the proliferation of Social Media and Amazon to the impacts of Globalism, Climate and IoT, our sense of security is being threatened. ​Fortunately, a few things are a constant or a known. I will discuss just one, the sun, The Ultimate Hedge. The sun is a sustainable, renewable free source of energy that is totally inexhaustible. Sunlight striking the earth’s surface in just one hour delivers enough energy to power the World Economy for an Entire Year. We know the sun will rise everyday and we can predict the average sunlight/solar energy in any geographical location in the world over a period of time. “I’d put my money on the sun and solar energy. What a source of power! I hope we don’t have to wait until oil and coal run out before we tackle that.” –Thomas Edison What does this mean to my business you say? A commercial enterprise does not have complete control over revenues, tax rates, regulation, cost of capital, cost of labor, electricity cost or a host of other things. A lot of these expenses vary and continue to rise year after year after year, eating into your margins with little vision into what might change next. You can control and manage one of these expenses or greatly reduce the inflationary impact on your bottom line . That is your electricity cost. Depending on your business profile, size, usage and load characteristics this can be a manageable or extraordinary impactful line item. Based on the series of knowns highlighted above you can control, manage and reduce your electricity expenditures and exposure to future rate hikes by leveraging the power of the sun. Here is why you should consider installing solar now. Own Your Energy!Commercial rooftops are typically flat, unobstructed and exposed to solar energy. You can utilize this free resource and turn your rooftop into a known, predictable revenue stream/savings with relatively little ongoing operational cost. You can determine the cost to install the energy production and therefore you can know with confidence, your reduction in energy expenses, Return On Investment and Changes to Cash Flow. Simply put, solar will reduce risk and cut cost and that means more money to your bottomline. Do you know what solar means to your business financially? Solar is a Smart Business Decision and we would love to show you how. Put your money on the sun and solar energy! Wow, time flies! It seems like yesterday when the Federal Solar Investment Tax Credit, #ITC was first implemented. Here we are, a decade later and what do we have to show for it? One thing for sure is that short term incentive programs are a double edged sword, as many developers chase expiring incentives (federal, state & local) and pull projects forward. This policy induced, industry volatility makes it difficult to successfully operate a solar enterprise through economic cycles and over a long period of time. We have seen manufacturers, financiers, developers and installers alike fall victim to this practice. We have seen the Titans of the industry go bankrupt in a sector that is doubling every 2 years. It seems as though the industry has been commoditized at its very infancy. Technology advancement has shortened the #Technology S-Curve and competition is driving down margins. So then, who is the biggest beneficiary of Solar? The #environment is certainly a beneficiary, but the Biggest Beneficiaries are the Users of the Technology. Especially when we look at commercial enterprises with non-revenue producing rooftops. How are they benefiting? In two words, Cash Flow! Solar Technology increases the cash flow to a business enterprise, by lowering current electricity cost and more importantly mitigating future energy rate hikes. On June 8, 2014, Warren Buffett revealed that Berkshire Hathaway Inc (NYSE:BRK-B)subsidiary MidAmerican Energy (now renamed Berkshire Hathaway Energy) had invested $15 billion into solar and wind projects. Buffett added, "there's another $15 billion ready to go, as far as I'm concerned." 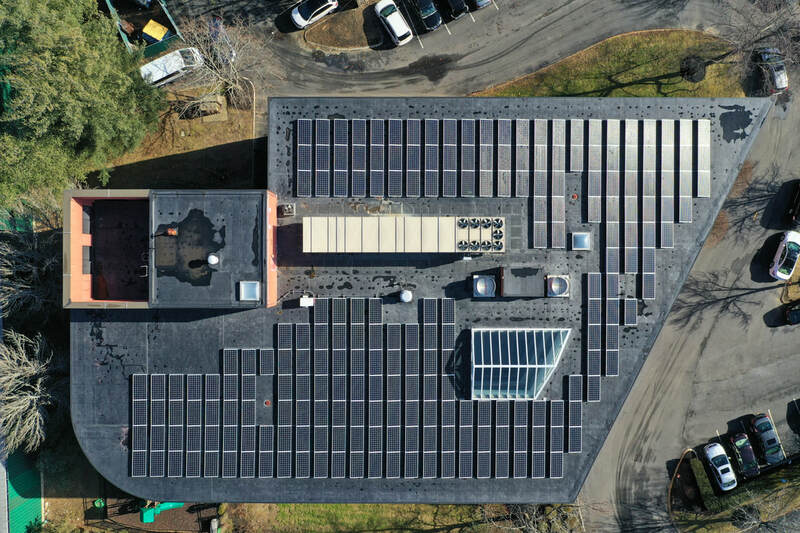 One could argue that today may be the best time for a business or building owner to invest in a solar technology system for their facilities. Commercial system installation cost have fallen some 60% since 2011 to under $2.00 per watt. In 3 short years the Federal ITC will begin to step-down from the current 30% level. In 2018 the 50% Bonus Depreciation begins to sunset to a lower rate. Interest Rates are at historical lows. Repeat! Interest Rates are at historical lows. Current Global Solar Panel over capacity is causing sharp price declines and creating a buying opportunity for commercial building owners. The US 30 year treasury is yielding under 3%. The Dow is at all-time highs. Corporate revenue growth is sluggish. The annual 30 year returns on commercial solar systems are well in excess of 10%, often 15% or more when you consider the 3% #electricity inflation. Better yet, a solar technology system has known returns year after year after year. Solar panel production is warrantied for 25 years and the average sunlight is known. Now, as we once again approach expiring incentives and fierce competition, capturing the power of the sun has become a buyers market. Now is the time to begin the process of understanding how solar can work for your business. Now is the time to engage with your Distributive Solar independent solar consultant. Your commercial or industrial property might benefit from installing solar, and we would love to show you how.